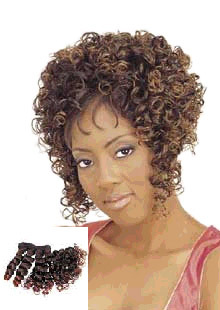 Medium Spiral Curl. Pull and Loose, Style as You Wish. Colors**: 1(Black), 1B(Off Black), 2(Dark Brown), 4(Brown), 27(Honey Blonde), 30(Light Auburn), 33(Auburn), T1B/144(1B Mixed w/ 144 Tip), T1B/30(1B Mixed w/ Light Auburn Tip), T1B/Bur(1B Mixed w/ Burgundy Tip), 1B/130T(1B Mixed w/ Light Copper Tip), 1B/350T(1B Mixed w/ Red Copper tip), 2/27T(2 Mixed w/ Honey Blonde Tip), 144(Gold Blonde).